On Saturday ‘all roads’ led to Uganda Investment Authority’s Soroti Industrial and Business Park where the grand opening of the long-awaited Soroti Fruit Factory took place. 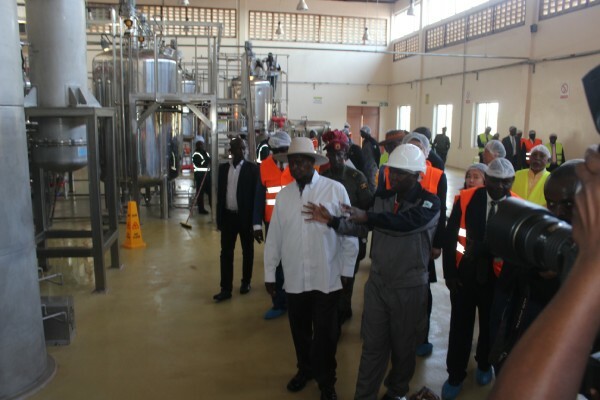 President Yoweri Museveni opened the eight-million-dollar plant that produces orange and mango juice, named Teju, as well as their juice concentrates. The factory, the first to sit on the expansive Soroti Industrial and Business Park operated by Uganda Investment Authority, is owned by Uganda Development Corporation (UDC), with 80 percent shareholding, and Teso Tropical Cooperative Union, holding 20 percent. The Korea International Development Agency (KOICA) offered 7.8 million dollars to setup the factory, with the Government of Uganda, through (UDC), providing the remaining two million dollars. UIA provided the land. According to Josephine Okot, the Chair of the Board of Soroti Fruit Limited, the factory has the capacity to process 96 tonnes of oranges and mangoes daily. Okot said the factory, at full capacity, will employ 250 people directly and over two million people indirectly. The Minister of Trade, Industry and Cooperatives, Amelia Kyambadde, said the factory has the potential of improving incomes and livelihood of the people of Teso, who collectively have 8.2 million citrus trees. President Museveni said fruit farming is “the medicine for poverty in Teso”. The president also recommended poultry rearing, dairy farming and fish farming as other anti-poverty medicines for the region. The president said the challenge of drought will be solved through small-scale irrigation schemes, preferably at village level. On land fragmentation, the President reiterated the need for families to aggregate land instead of splitting up. According to President Museveni, Uganda has the capacity to finance such projects, stressing that what is key is for partners, like the Koreans, transferring technology, knowledge and skills to Ugandans in order to run them successfully. The Korean Ambassador Kim You-Churl said their support to Soroti Fruit Factory was informed by a thorough background process, adding that it should translate into economic benefits for the people in line with Uganda’s Vision 2040. Ambassador You-Churl said the factory will not only create jobs but also boost farmers’ productivity and improve post-harvest handling of citrus. The Soroti Fruit Factory has been in the works for years, and it was quite a relief to see it finally opened. UIA, which offered the factory land in its industrial park, was represented by Board Member, Fred Opolot, the Head of the One-Stop Centre, Joseph Kiggundu, the Director of Investment Promotion and Development, Sheila Karungi, and Inspector of Works, Paul Echatu.